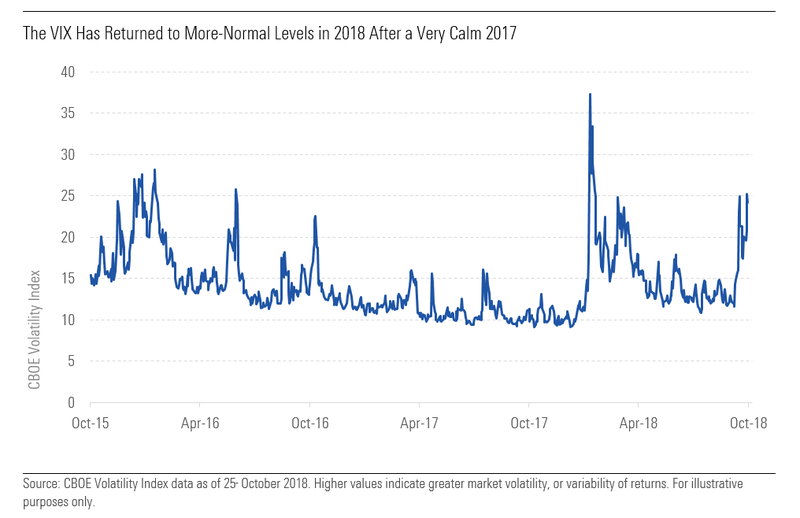 Volatility returned in October, sending the equity market spiraling downward for a second time in 2018. Whenever this happens, investors naturally look for explanations for the downturn and wonder whether they’re in the right investments. We believe this response to volatility – although natural – is likely unhelpful. Discussing these types questions can be a much better reaction to market volatility than trying to understand every market move or selling to quiet fears. The good old days seem to be quickly sliding into the past. As recently as a year ago, markets were on a joyride. Ever-higher returns pushed painful memories of the global financial crisis further and further into the background. Even the U.S. market gained ground every month in 2017, delivering around 22% for the full-year. The fear index, also known as the VIX or more formally the CBOE Volatility Index, rises during periods of market stress. But in 2017, the VIX couldn’t have been less scary, as it set record lows amid a seemingly ever-rising market. In fact, from January 1990 through December 2016, the VIX fell below 10 on only nine days in 27 years – but in 2017 it sat below 10 for 52 days so calm were the markets. Whether the market is, or will become, completely comfortable with the trade picture remains to be seen. 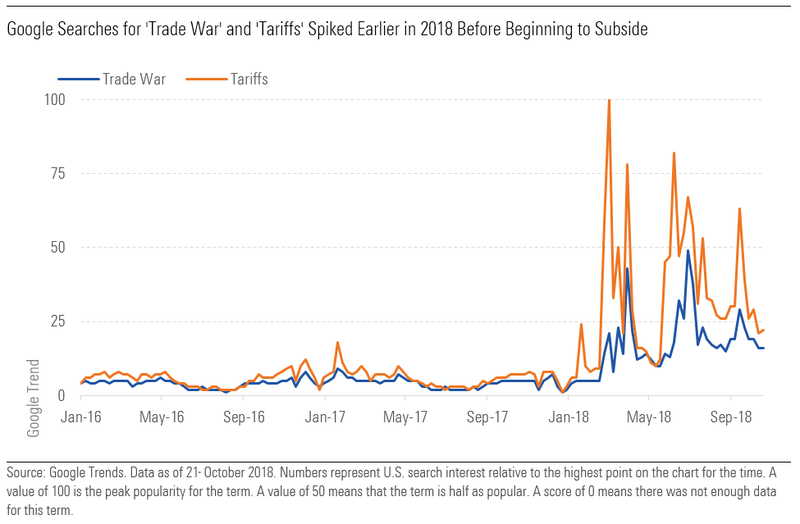 Reaching a new North American trade agreement gave some relief, but progress has been elusive in talks with China, a situation that appears poised to potentially flare at any moment. But again, knowing when a flare-up might happen, how long it would last, and how it might impact markets strikes us as a monumental task. There’s a better way to invest. Not every market hiccup needs deep analysis. Focus on fundamental research, contrarian signals, and valuations. In the long term, investors get paid by the current and future cash flows of the securities they own. Seek to buy securities when prices are low compared to expected cash flows. This valuation work relieves you from becoming overly concerned about the next central bank rate decision or the outcome of an election. Should We React to the Spike in Volatility? The short answer: No. Focus on long-term valuations – the true and durable value of an asset class, rather than the volatility of its market price. Having a long-term perspective makes the next turn in the trade spat less concerning. Instead, ask, "How might this affect fundamentals over the next several years?" Investors who trade on emotion and short-term market moves are more likely to sell after markets have gone down and buy after they’ve risen. Seek to do the opposite, stick to a principled approach to investing, designed to keep you rational in a sometimes-irrational world.